Muna cin namansa (did I get the idiom right?) 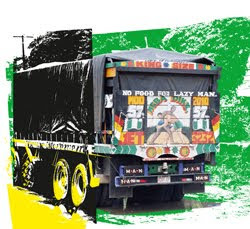 or speaking of the devil, well almost … There I was arguing with Malam Aliyu about whether or not there were representations of black men in action scenes in contemporary lorry arts. No, I argued, I spend a whole year and hadn’t even seen one. No, I emphasised, I spend a whole day going through the pictures a friend of mine took at lorry garages in and around Kano just this year and there wasn’t even one. That must be significant I insisted. And then, today, I open my inbox and stumble across this image in the announcement for an exhibition in Lisbon! Once again, proven wrong and effectively reminded of the limits of fieldwork. Oh well, just proves that I need to spend more time in Nigeria, ko?